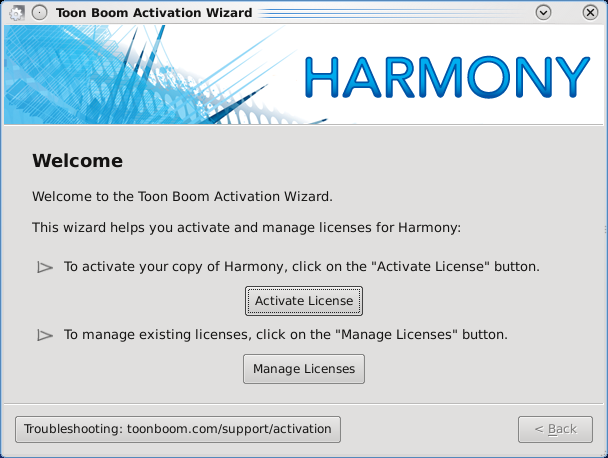 When upgrading previous installations of USAnimation, Opus or Toon Boom Harmony, you should pick a time when Toon Boom Harmony production is slow or stopped. During the upgrade, no users can run any of the USAnimation, Opus or Toon Boom Harmony modules and all rendering jobs must be complete. 1. Make sure that no one is running any versions of USAnimation, Opus or Toon Boom Harmony. All USAnimation, Opus or Toon Boom Harmony modules must be closed on the server and on all of the clients. 2. Make sure that all batch rendering and vectorizing is complete or that the queues are empty. You can check the status of Vectorize and Render queues from the Control Center module. ‣ In the Control Center module, use the Queue menu Environment > Vectorize Queue or Render Queues to open the Vectorize and Rendering Queue for all environments. The queues should either be empty or the status of all jobs should be Completed. Note: It is not required to delete the startup scripts from /etc/init.d/ as the Harmony install script will update them automatically. You can back up the entire Harmony folder by renaming it to make sure all config files are kept. Delete or backup the Harmony Installation by renaming the folder where it is installed. Default install location for 7.5 and earlier is /usa. 5. Cleaning the KDE menu. Using the KDE Menu Editor that can be started from the KDE menu. The location will vary depending on the version of Linux installed. The shortcuts will be removed from the KDE menu the next time you log in. 6. Uncompress the distribution file. 7. Change to the directory that was extracted from the tar.gz file. 8. While logged in as the root user, run the install script specifying the options required for your server. ‣ -b: mandatory. 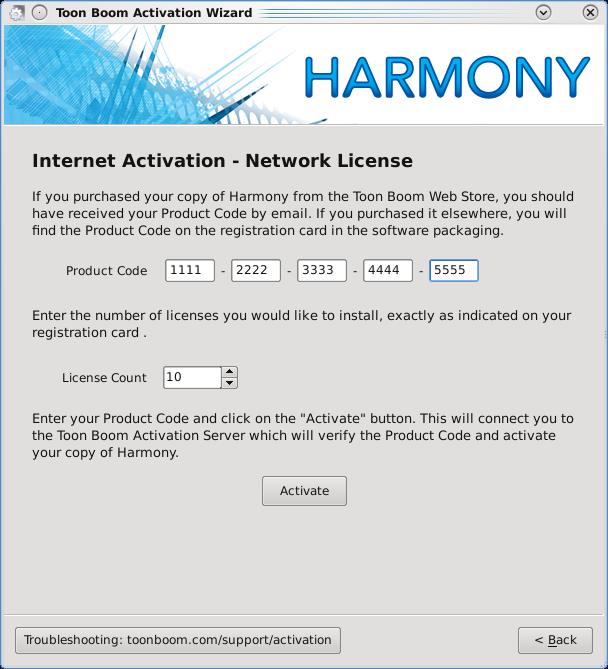 This will install the binaries required to run Harmony. ‣ -d: configures the tbdbserver for auto startup. Required when installing a server. ‣ -l: configures the Link_srv for auto-startup. Required if the server has window clients. ‣ -p: Configures the tbprocess for auto-startup. Required if the server will be performing batch processing. ‣ -u: Updates the dict files in the USA_DB/dicts. 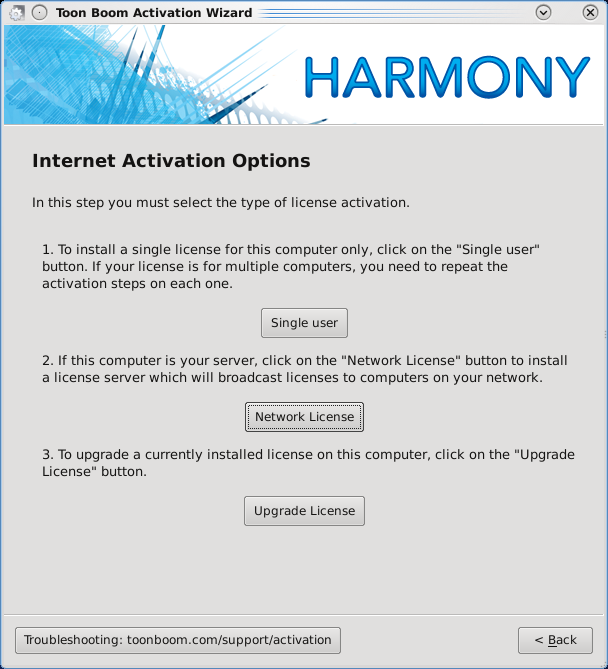 This is mandatory when upgrading a server from a version previous to Harmony 10. This option will only work if -d is also selected. ‣ -kde: installs Harmony menu shortcuts in the KDE menu. ‣ Copy the server.ini, Manager.conf and any other files you must backup to the new installation. From the backup location to /usr/local/ToonBoomAnimation/harmony_10.0/etc/. Before being able to start the Harmony services, you will need to make modification to the .cshrc that is in usabatch's home. The.cshrc of the all other users of Harmony should be edited to remove the lines that are used to source the usa_cshrc file. It is not required to source this file anymore as the path to the application is now added to the PATH variable via the files in /etc/profile.d. ‣ Open the files /etc/skel/.cshrc with your favourite text editor and remove the lines that source the usa_cshrc file from it as well. 1. 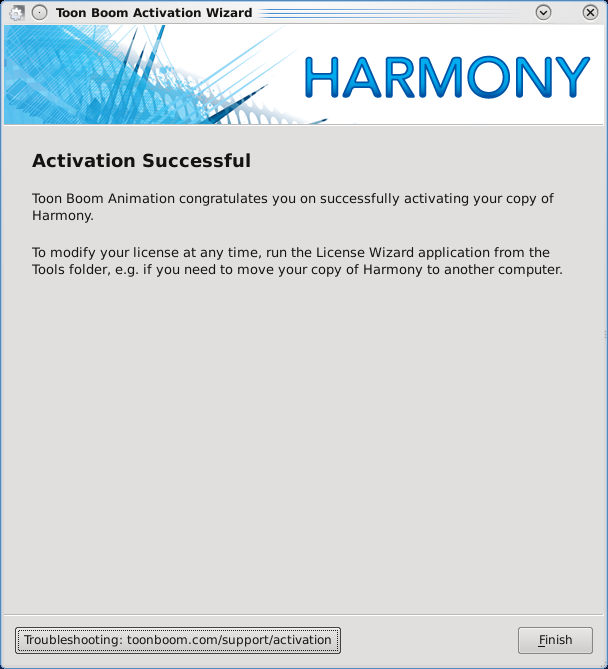 To launch the License Wizard go to: /usr/local/ToonBoomAnimation/harmony_10.0/lnx86_64/bin/ in the terminal. 2. 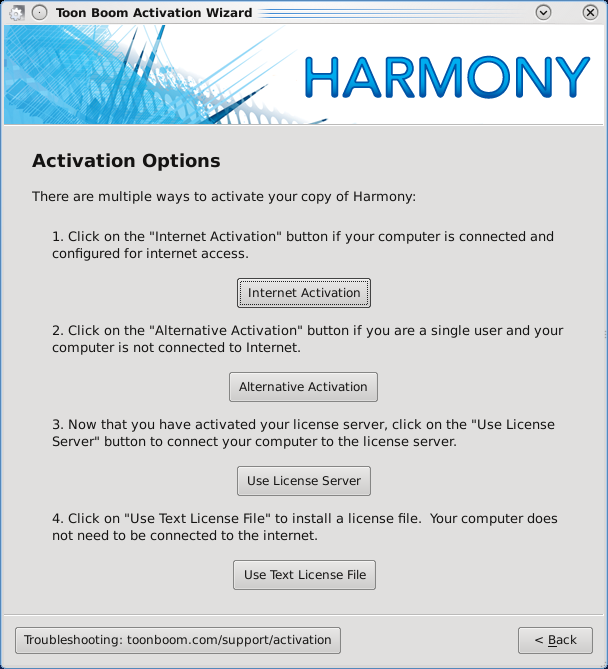 Click on Activate License. 3. Click on Internet Activation. Once activated, server licenses can only be returned to the activation server once. A previously returned licensed cannot be re-activated. Make sure you are activating the license on the correct computer. 9. Verify that the FlexLM license is working properly by using the lmutil lmstat -a command. 11. Once the services are started, check the logs to make sure that they have been started properly. Check all the logs to see if the services are running properly. Logs are located in /tmp. 12. Start Harmony and open a scene to see if the server works properly. 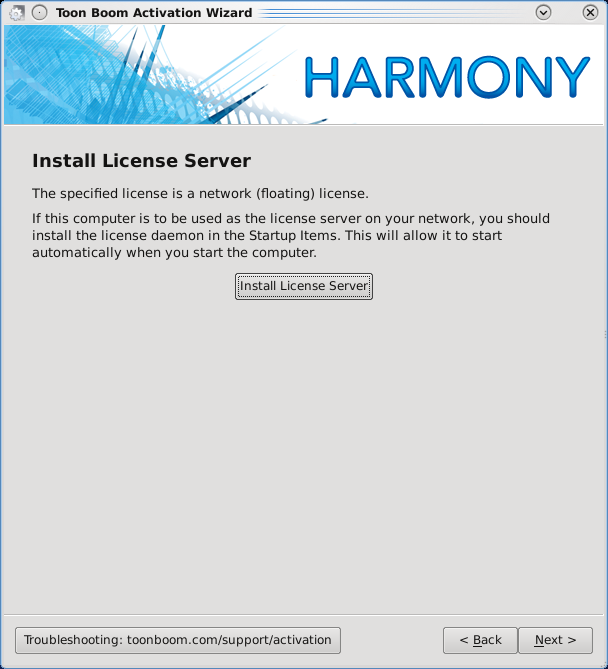 If the Linux server has Linux or Mac OS X clients, the nfs exports need to be updated with the path of the new Harmony binaries. 1. When upgrading a Linux server, a small modification must be made to the usa share path to point to the new install. "vi /etc/samba/smb.conf" and change the path under the [usa] share to the path of the new Harmony install. 2. Once the file is saved, run the "testparm" command to check that you have not made any basic syntactic errors. 3. Press Enter to see a dump of your service definitions. Level II oplocks can only be set if oplocks are also set. To get rid of this error, you need to add the level2 oplocks = No parameter in the global section of the smb.conf. See the next section for all the parameters that are required in the smb.conf. 1. Verify the configuration of the smb.conf. It is always safe to verify the configuration of the smb.conf. Parameters needed in the [global] section. Default parameters for the shares. 2. Remember to always perform a testparm after making changes to the smb.conf. 3. Restart the smb service. If possible, reboot the server to verify that all the services are properly started. 5. Once the server is booted, check all the logs to see if the services are running properly. Logs are located in /tmp.